We are greeted by three cradling, fevered ghosts (Martyn Garside, Rachael O’Neill and Keren Smail), individual nodes who re-animate to find and fold themselves into the arms of another. Their approach and contact triggers a rejection of touch as one of the dancers melts out of the frozen embrace to find another moment of solitude. This passing of energy and breath continues long after the house lights dim and I begin to see the residue of bodies that are no longer there. Through repetition there is generosity. It is here after eight or nine minutes that I begin to notice new details: how the gait of the body shifts, where a gaze rests, and this repetition begins to sharpen my focus. In THE END movements and moods are built, cradled, and re-presented enabling you to see them from different angles. A circular footwork pattern that oscillates between walking backwards in a circle and moving it forwards with a change of rhythm is a simple gesture, but placed on repeat through a low level of haze that softens the bodies and casts pools of light and shadows across the stage, it becomes bewitching. Each tight metronomic step and shift in weight pulls me deeper into an alternative choreographic landscape. With residues of the sinuous form of Krump, where movement and emotion are released by alternative parts of the body, Webb frames dozens of striking images, like Smail chewing on Garside’s elbow, their limbs isolated and out of sync, bodies needing to be set and re-set and reverberating to a different beat. There’s a scenographic deftness that erases any division between the choreography, soundtrack and lighting — the composite parts are chiming to define a mood, intensity and focus that aligns. Four floor-mounted, magenta strip lights and a soundtrack featuring Swallows and Mediate by Rrose offers experimental drone techno that sets ears to fervour and makes knees wobble with its bass. With a clear philosophical framework and intention behind the work, Webb offers some guiding words in the programme: “THE END is an invitation to look at ourselves, our world and to consider what we leave behind”. In the 55-minute performance Webb invites audiences to linger, spend time and burrow amidst his choreography. The intensity from being contained in a 60-seat studio theatre in close proximity to a frenzy of movement and back-lit, silhouetted faces of ecstasy is a perfect antidote to the 3000+ performances at the Edinburgh Fringe. Webb carves his choreography from a different stone and it is entirely refreshing. He resists clean line and lyrical arcs and emphasises jittery glitches and the degradation of a movement. Seeing Garside in raptures, totally embodied and living inside the moment is incredible to watch; his total being is immersed in physical and emotional fireworks. We begin to see the end of THE END about 10 minutes out as the rejection of touch at the beginning is inverted: running, wrist clasps and spinning increases: an urgency takes over, building a rhythm incrementally to a point where the dancers lungs give up, their bodies unable to rise again from the repeated falls. They are spent and exhausted, at an end. As they get up slowly and leave, the audience is alone with the stage and its echoes. THE END will not suit all who encounter it but if dance, choreography and audience tastes are to alter and diversify then we need to embrace difference and find more room for voices like Webb’s. 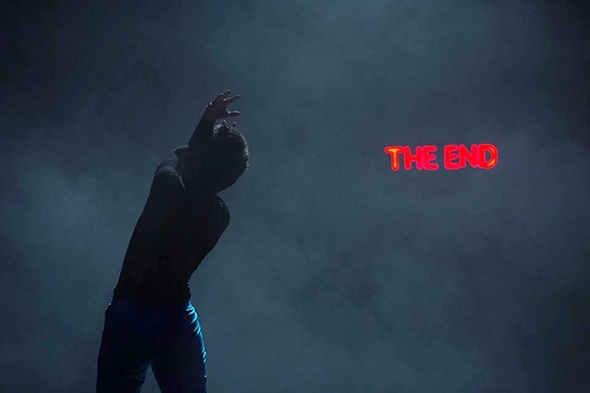 THE END is a sensitive and generous performance and with Webb’s rare craft he enables audiences to see, sharpen their focus and stay with difference until the end.